It looked like bulls and bears got something out of Tuesday's trading. Bulls get the overall winners nod as there were fresh breakouts for the S&P, Dow, Nasdaq 100; with the Russell 2000 and Nasdaq adding to their respective breakouts. Volume rose in line with accumulation. But, semiconductors had a lackluster day despite logging a 1% recovery. 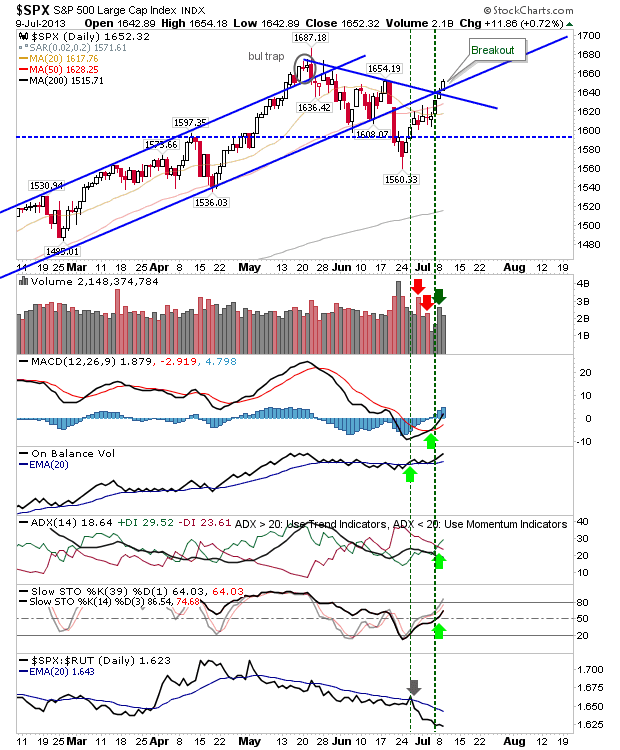 The S&P finished the day with a number of support levels below it, notably the former channel support which crossed through (now defunct) resistance from May highs, with the 20-day and 50-day MAs nearby. 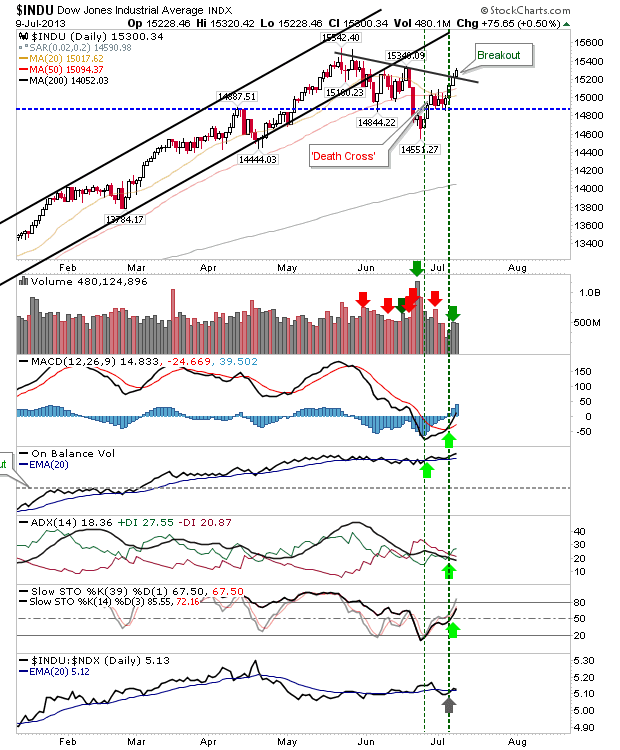 The Dow had a less fussy resistance breakout, with volume failing to meet the accumulation threshold. Action isn't really on Large Caps, it's more an after-the-fact catch-up advance. The Russell 2000 remained the star index. It enjoyed a decent morning gap and was able to build on it. Round number 1,000 should be big support. Key index to guide the broader market higher and exhibiting excellent relative strength. 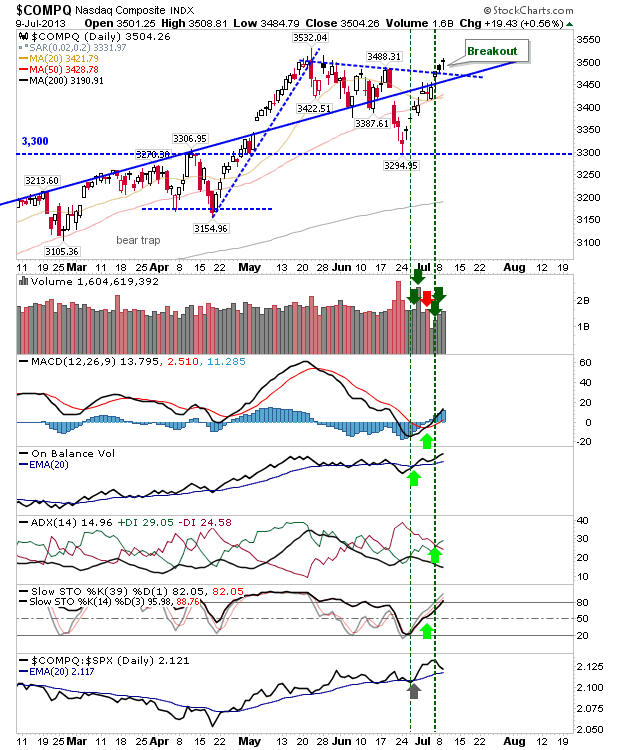 The only party-pooper was the Semiconductor index, despite its 1% gain it failed to regain the breakout and didn't do enough to erase the prior day's bearish engulfing pattern. This is still a good short candidate despite strength elsewhere. 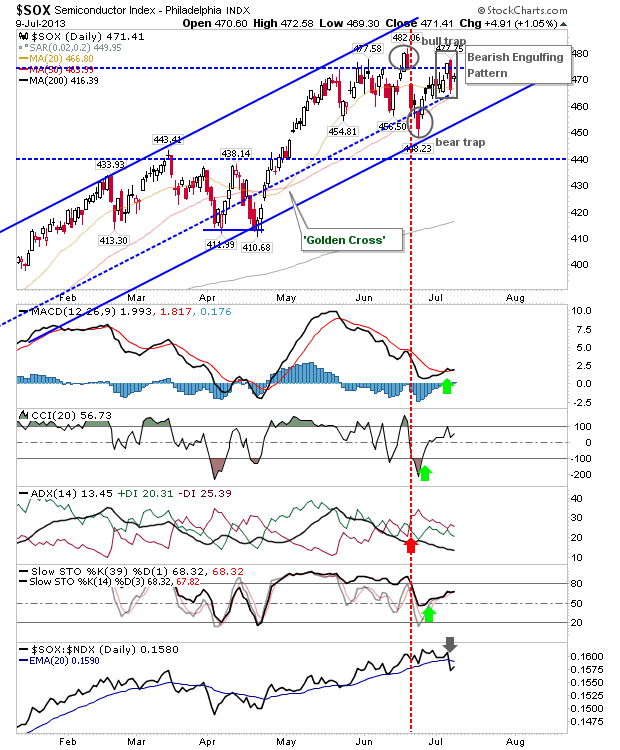 The underwhelming semiconductor action left things confused for the Nasdaq and Nasdaq 100. There are workable breakouts for these indices, but the doji/hanging man candles suggest a level of indecisiveness to the breaks. Shorts may find something in the near term on a break of day's lows. 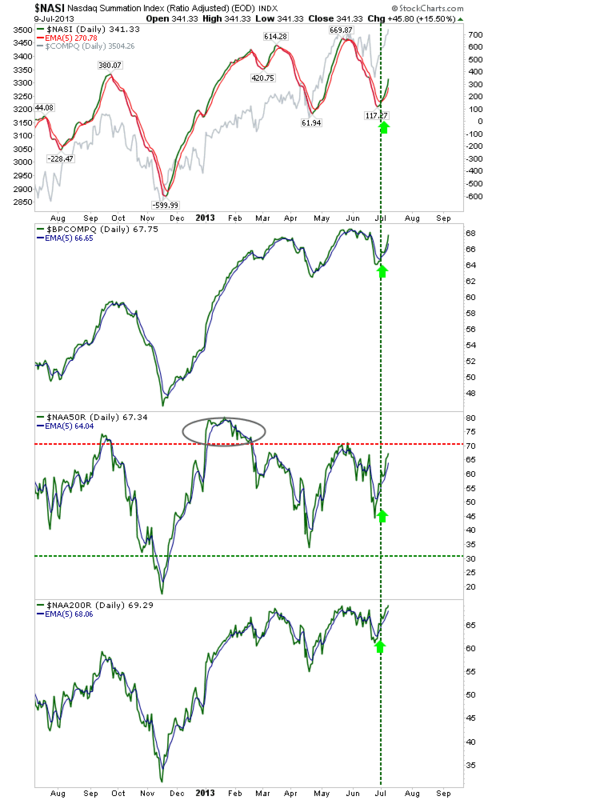 Nasdaq Breadth is also coming back into overbought territory, although the Summation Index suggest this rally could last a number of weeks before it gets toppy. 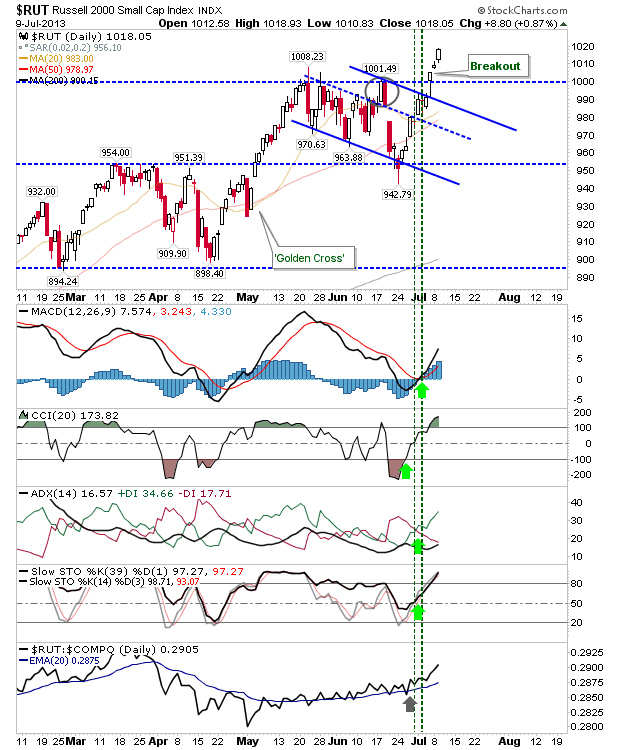 Shorts may enjoy a 1-2 day trade, but the underlying trend is bullish. For traders, the Russell 2000 looks to be positioning itself as a measured move higher. The April-May advance offered 110 points of upside, which would give a comparable target of 1,052 for the current move. More important for the long term will be how this index reacts when it eventually sells off and approaches 1,000. Shorts have a narrow focus of opportunity: the semiconductors are weak and have diverged hugely away from copper prices, but the broader market will keep shorts tetchy and unlikely to stick around if buyers are able to push the index above the engulfing high.